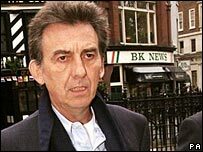 A woman who once broke into former Beatle George Harrison's Hawaii home has been found dead after an apparent murder-suicide in California. Cristin Keleher, 34, made headlines in December 1999 by entering Harrison's Maui estate and then cooking herself a frozen pizza. California police announced that her body had been found in Truckee with that of a 48-year-old man in a car. Both had gunshot wounds to their heads, according to a coroner's report. "From the investigation it appears that she was shot first and then he shot himself, so it is a murder-suicide," Nevada County Sheriff's Sergeant Shannan Moon told Reuters on Sunday. "It sounds like a closed case." Ms Keleher's body and that of Stanley Everett Merchant, 48, who was also from the Truckee area, were found inside a blood-splattered sports utility vehicle on 19 December. According to the Tahoe Daily Tribune newspaper, authorities said evidence indicates Ms Keleher was shot outside the vehicle, then was placed inside the vehicle where Mr Merchant then lay down beside the body and shot himself. Ms Keleher's funeral will be held on Wednesday by her parents in her former home town of Neptune, New Jersey. She eventually served four months in prison for burglary and theft after the prosecution said she had been stalking Harrison for years. She was released in August 2000. Ms Keleher, who described herself as a self-employed musician, is said to have told police that she entered through an open sliding glass door. Just weeks after Ms Keleher was found in his Hawaii home, Harrison was seriously injured after being stabbed by an intruder at his British mansion at Henley-on-Thames, Oxfordshire. He recovered from the attack, but eventually succumbed to cancer in November 2001.